The Defense Department came under fire Thursday for a U.S. Army Reserve presentation that classified Catholics and Evangelical Protestants as "extremist" religious groups alongside al Qaeda and the Ku Klux Klan. 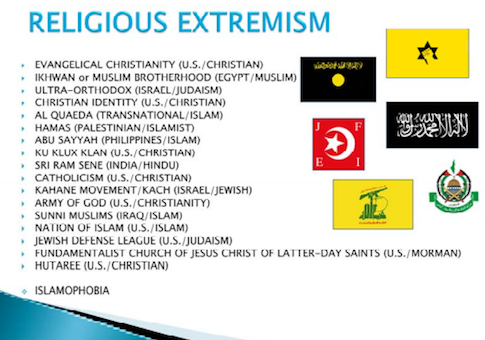 The presentation identified seventeen religious organizations in a slide titled "religious extremism." They include al Qaeda, Hamas, the Filipino separatist group Abu Sayyaf, and the Ku Klux Klan, which the slide identifies as a Christian organization. "Religious extremism is not limited to any single religion, ethnic group, or region of the world," the slide explains, in language that closely resembles the text of a Wikipedia page on "extremism." "Men and women of faith who have served the Army faithfully for centuries shouldn’t be likened to those who have regularly threatened the peace and security of the United States," said Col. Ron Crews, a retired Army chaplain and the executive director of the Chaplain Alliance for Religious Liberty. "It is dishonorable for any U.S. military entity to allow this type of wrongheaded characterization," Crews said in a news release. The SPLC has dubbed organizations "hate groups" for promoting Christian teachings on morality and sexuality. A SPLC map of "hate groups" was used by a gunman in 2012 to target the conservative Family Research Council for its position on gay marriage. The gunman shot a security guard at the FRC’s headquarters. The SPLC has refused to comment on its role in the shooting. The Archdiocese for the Military Services, a Catholic organization that trains and endorses military priests and chaplains, said in a release that it was "astounded that Catholics were listed alongside groups that are, by their very mission and nature, violent and extremist." The AMS called on the Pentagon "to review these materials and to ensure that tax-payer funds are never again used to present blatantly anti-religious material to the men and women in uniform." An Army spokesperson said the presentation "was produced by an individual without anyone in the chain of command's knowledge or permission." The Army removed the offending slide after receiving complaints. The person responsible for the presentation, the spokesperson said, "was not a subject matter expert, and produced the material after conducting Internet research." "It is hard to understand how a priest like Chaplain Kapaun can be honored in one breath while his faith-group is dishonored in another," Crews said. This entry was posted in Politics and tagged Department of Defense, Islamic Extremists. Bookmark the permalink.